On November 1, 1869, just days before the opening of the Lincoln inspired Suez Canal, the new Cairo theatre was inaugurated with a performance of Verdi’s Rigoletto. In the following days and months, Verdi was persistently sought by the Viceroy of Egypt, Ismail Pasha, to compose a new opera celebrating the great history of his country. A plot was sent to Verdi written by the Egyptologist Auguste Mariette entitled “La Fiancee du Nil,” which was the seed crystal from which AIDA was born. “[T]he pleasure itself, which art provides, becomes a means to morality.”1 Classical tragedy allows one to ponder the similarities and differences between the society on stage and their own. What choices do the characters make that are being made by leaders today? What are the implications for the whole society when the leaders are consumed with their own passions instead of the future of their nation? What is my role as a citizen? All these questions confront the audience of any classical tragedy. AIDA, one of Verdi’s great tragedies, unfolds many lessons for the thoughtful audience, especially when the production clearly places these lessons before the mind’s eye of the audience. Even more, the lessons embedded within AIDA are universal. Those from any age can identify with the struggle all young adults face between self-centered desires, and desires that put their country or mankind before themselves. One must simply think of Dr. Martin Luther King Jr. or Joan of Arc to find individuals who rose above the tragic scenes of their time. They spoke as if from outside the bounds of prevailing beliefs and behaviors, driving human progress forward with their courageous acts. In addition, any astute student of history knows that the conflicting outlooks of empire vs. republic have determined the organization and, thus, fate of human societies and cultures for the last 2,500 years and more. Therefore, as one watches a society that is gripped by what Lyndon LaRouche has termed ‘the force of tragedy”2 they are led to ponder the greatest question available to the human individual, what principles can I discover that when acted upon will aid in human progress today and beyond? 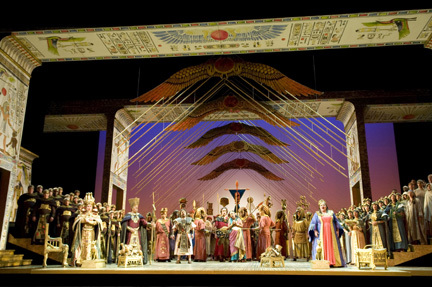 Verdi sets AIDA in approximately 1565 B.C., during the rule of Ramses III, ‘the Egypt of the Pharaohs’. This is an historical Egypt of great renown, Ramses III built a network of canals bringing fertility to the land, kept just laws, raised regular taxes, and citizens erected statues of him as if to a semi god. Two centuries later the high priest of Phta didn’t want to put the statue of Darius before that of Ramses III, in Memphis 3. The opera opens with a new threat to Egypt, coming from the recently conquered and invading Ethiopia. The high priest, Ramfis (Luiz-Ottavio Faria, bass), is bringing the “dread commandment” of the priestess Isis (Priti Gandhi, mezzo-soprano) to the Pharaoh (Joseph Rawley, bass-baritone), determining further war or peace. The young warrior Radames sings about his desire to lead the Egyptian troops into battle to conquer their invaders all with the hope of returning triumphant and in the favor of the Pharaoh and the gods so he can take the captive Ethiopian, Aida (who, unknown to all Egyptians, is the princess of Ethiopia), as his wife. For the astute viewer the ironies abound in the first and second scenes, the great ruler Ramses III, is taking orders that will determine the fate of his kingdom from a priestess and the central character Radames, played by Antonello Palombi (tenor), desires nothing more than conquering the kingdom of the woman he claims to love and use that accomplishment to gain her hand. 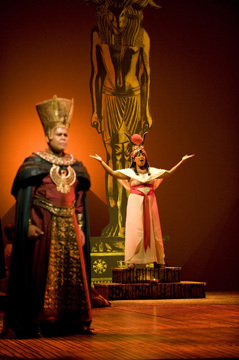 Luiz-Ottavio Faria (Ramfis) and Priti Gandhi (High Priestess). disbelief when she sees her father, the king Ethiopia, among the captives, he tells her not to reveal his identity so he can carry out his planned revenge. Aida begs for mercy for her countrymen. Radames asks the Pharaoh to grant mercy to the captives, and the ensuing counterpoint that unfolds between the populace and priests, gives the audience insight into the source generating this culture’s ‘force of tragedy’. The priests sing for the Pharaoh to close his heart and ‘death to all’ while, the populace sings for mercy and for the priests to calm their anger. AIDAtriumphal scene, chorus and principals. Verdi’s poetic genius shines as this tragedy naturally grips the audience and pulls them into the culture of ancient Egypt, seeing their nation’s own grandeur and folly mirrored in that far away time. LaRouche clarifies this idea, “[i]n all of the relevant cases, the playwright has crafted a truly dynamic image of a fatal, self-inflicted doom of that society, especially of its panoply of leading figures. The great playwright crafts the drama in such a fashion, that a well-directed, well-acted performance conveys what must be described as a sense of a dynamic principle which envelopes the interaction of the wills of the participating essential characters, a sense of a society which is inflicted, from the top down, with a catastrophic outcome lurking among the reigning social forces of the case . . . Indeed, all the world's a stage! Those relevant characters of the drama interact in ways which foretell their resulting mutual doom. We have, thus, the spectacle of a governing force of a nation, whose actions are committed to effecting their own mutual doom. This set of dynamics is the essential tragedy.”5 From there we are swept through the tragic unfolding of the events of Act III and IV. 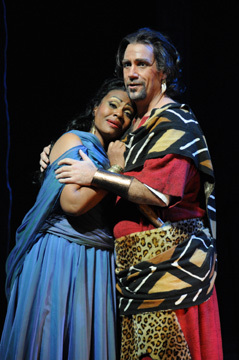 Lisa Daltirus (Aida) and Charles Taylor (Amonasro). Speight Jenkins and Seattle Opera created a delightful and powerful experience of Verdi’s AIDA. Conductor, Riccardo Frizza, brought forth Verdi’s composition in all its glory, from the very sweet pianissimo lines of love to the very triumphant and terrifying scenes of religious and military grandeur. Lisa Daltirus and Charles Taylor (Amonasro, baritone) gave honest portrayals of two very challenging characters. It was clear that they used the strength and flexibility of their voices as tools to communicate Verdi’s poetry. The other voices were beautiful, as well, but did not have the vocal transparency and varied palate of color that comes with the emotional commitment that Daltirus and Taylor made. However, I was quite disappointed in the concentration and etiquette of the Seattle audience. It was as if they had no need or desire for the subtleties Verdi created with which to contrast the big and triumphant, from the quiet introduction of the prelude to the captivating musical lines that launch the drama of Act III there was coughing, talking, even a ringing cell phone. Another disappointment was the hedonistic, unhistorical, and unpoetic ballet performances. Thus, pulling one out of ancient Egypt and into modern day western civilization. On the whole, Seattle residents would definely benefit from experiencing this production of AIDA. It was clear that Seattle Opera was striving to do justice to the genius of Verdi, who has left so many musical dramas for us to learn from. Schiller writes, “the best tragedy is that where the pity excited results more from the treatment of the poet than the theme,”6 and the treatment of the poet was brought forth with much thoughtfulness and honor. Bravo Seattle Opera! 1. Friedrich Schiller, On the Reason Why We Take Pleasure in Tragic Subjects (1791), Poet of Freedom Vol. 4, Schiller Institute, Inc., 2003. 3.Hans Busch, Verdi’s AIDA: The History of an Opera in Letters and Documents, pg. 476-7, University of Minnesota, 1978.